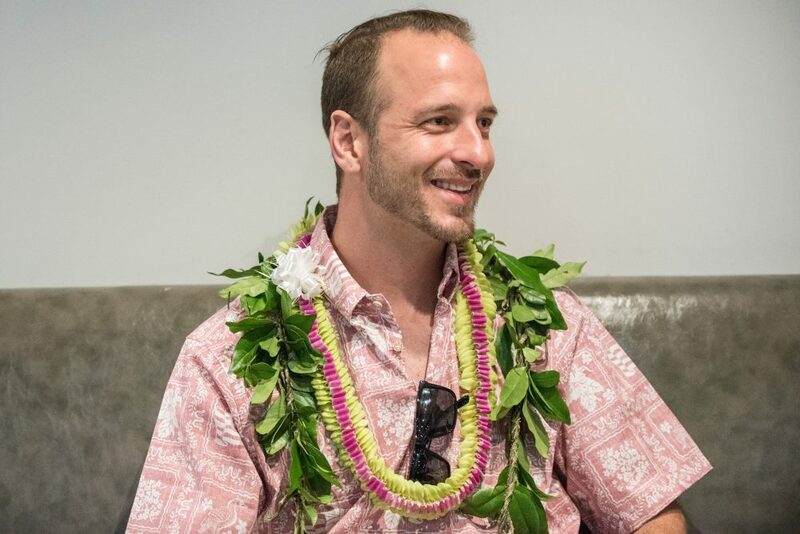 Jordan Keao is a Hawai‘i-born executive chef and owner of San Francisco’s ‘āina restaurant. Before taking part in a Zócalo/Daniel K. Inouye Institute “Pau Hana” discussion titled “Why Is the Mainland So Fascinated By Hawai‘i’s Food?” at Artistry Honolulu, he spoke in the green room about comfort foods, wanting to cook for Barack Obama, and the calmness of the chefs of Hawai‘i. Was there a particular experience that made you decide to have a career in food? There were many, growing up. With my family being integrated in food, and Hawai‘i itself being integrated in food, everything we do revolved around food. But I think the experiences that impact me the most, even today, are the ones where we were building an imu [earth oven], as a kid, putting a pig inside, building it, taking it apart, learning how to separate the animal, massage it—all the details that make kālua pig amazing. Those are the nuances that I really got inspired by. Going fishing with my uncle, as a kid; my uncle was a fisherman on the Big Island. So going fishing, coming back, unloading the fish, scaling it with a spoon in the driveway, getting everything cut for the next day, to sell. It was so ingrained with the way of life that when I actually went to culinary school and started cutting fish and doing all these things, it was something that I’d already been doing. So it wasn’t just the cooking, it was the gathering of the food, and the preparation. Yes. It represented the circle of life, the humility behind being able to feed somebody. To me, that’s the greatest honor that I have as a chef, is being able to feed somebody. And the fact that they’re also going to pay me to feed them—I just can’t picture something that’s more special than that. Who are some of the most important teachers you’ve had in becoming a chef? My first job was working for Roy [Yamaguchi], in San Diego. Roy had a huge impact on me: the quality, the attention to detail, precision. My chef at the restaurant at the time was Garrett Mukogawa, who is now Roy’s right-hand chef for all the Hawai‘ian islands. He had a calmness to him. I always respected chefs of Hawai‘i because there is a calmness to them that is naturally ingrained as part of their personality, of people from Hawai‘i. And in the kitchen that’s not something that you normally see; you see a crazy chef running all over the place, yelling at people. That Hawai‘ian chef brought a new example of what leadership could possibly be in a kitchen. And that really blew me away. Sam Choy had a huge impact on me; I have almost every single one of his books. Without people like him, I wouldn’t have been inspired and I honestly wouldn’t know where to start today. You’re having a dinner party and you can pick anyone as a guest, living or dead. Who would you choose? I would love to cook for Israel Kamakawiwoʻole, a Hawai‘i musician, just because he had such an impact on me. I think someone like Queen Emma [of Hawai‘i]. Her passion for food and kalo [plant] was amazing. She had [certain varieties] that she liked the most, and some of those varieties I’ve been trying to work with people to bring back, because those are varieties that I think help other people around the world understand how important kalo is to us. And I’d definitely want to cook for [Barack] Obama. I think that would be amazing. My wife also would love to cook for Obama. And I would love to cook for my grandpa. I never got a chance to cook for my grandpa. I lost him when I was 17. It’s very simple. I was working my first job, at Roy’s, and Lakani Lau, the sushi chef there at the time—they have a roll named after her, the Lakanilau roll, if you ever go to Roy’s—and she said, “Jordan, you’re going to be an amazing chef one day. But don’t ever forget where you came from, and don’t ever forget the humbleness of the Hawai‘ian people.” I still think about it to this day. Before I got into cooking I actually was an amateur-pro windsurfer. And I think I might go back to that because I really miss being outside in the ocean. Yoga is a big part of my day. I’m tall, so doing yoga really is helpful. Working long hours, 12 to 16 hours a day, yoga also helps with my breathing, centering myself, remaining calm, and just when you have that organized chaos in the kitchen, you’re able to stop, take that breath, and lead with a real clear mind. Yoga and running are probably my biggest things that help ground me and re-set my button. Chinese steamed fish—but it has to be uhu. And then laulau and poi. But it has to be hand-pounded poi, not machine-pounded poi.